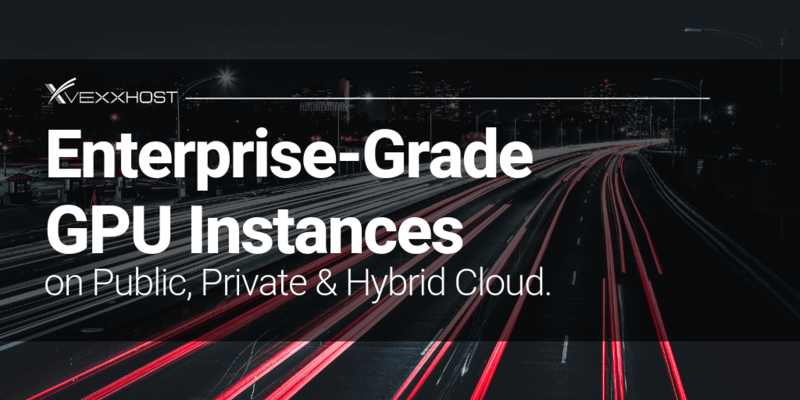 We at VEXXHOST are excited to announce the launch of our latest cloud offering: enterprise-grade GPU instances on OpenStack-based public, private and hybrid cloud. We are proud to be at the forefront of our industry with this latest addition to our ever-evolving offering. We know that an expansion of this nature is in high-demand and are thrilled to be providing the most relevant and progressive options to our client base. This new GPU offering will include fresh instance types and flavours that are intended to fit the market demand for high-performance cloud computing. These latest instance types will include up to 245,760 GB. Our new GPU instances will use enterprise-grade NVIDIA Tesla K80 accelerators. Each GPU provides 12 GiB of memory (accessible via 240 GB/second of memory bandwidth), and 2,496 parallel processing cores. In order to deliver unparalleled speed, and differentiate ourselves as an industry leader, the hardware offering also includes PCI Express and NVMe SSD local storage, making this already powerful solution incredibly fast and performant. Another important aspect to note is that we do not oversell GPU and CPU within those instances. GPUs and CPUs are fully dedicated. We have also ensured that the new instance types are powered by OpenStack’s latest release: Rocky. How to know if your company would benefit from GPU instances? The new instance type will primarily empower users working with compute-intensive and high-performance computing (HPC) applications. Taking into account that datasets have been increasing at high speeds in many technology sectors, this is positioning more industries to reap the benefits of powerful GPU cloud instances. However, enterprises in industries who use supercomputers stand to benefit most from GPU instances. Through the increased level of performance offered by GPUs, where data is massively parallel processed, companies will have the opportunity to lower their infrastructure costs as the time required to process data is dramatically reduced. The ability to process more data, quicker is highly beneficial for those in the Blockchain and big data industries, where time is one of their most valuable assets. GPUs also offer advantages where AI and machine learning is concerned as they permit the stored data to be accessed quickly, whenever necessary. For a limited time, we are offering a 10% discount on GPU instances for our public cloud. To learn more or to sign up, check out our cloud servers page!